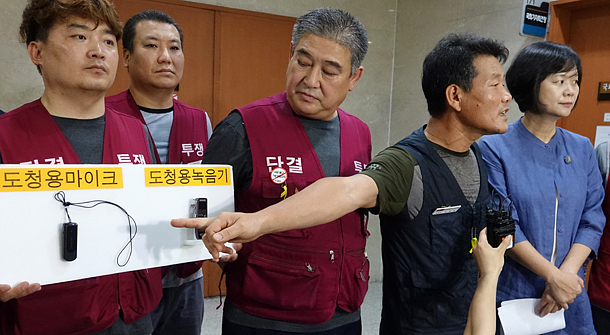 Members of LG Chem’s labor union reveal a listening device, discovered hidden in a lounge they use, at a press conference on Tuesday in Yeouido, western Seoul. LG Chem is under fire after it was discovered that one of its employees was caught installing a listening device to listen to conversations among members of its labor union last week. An employee of the top chemical company reportedly tried to eavesdrop on the members of the labor union on July 20 by installing a listening device in a staff lounge exclusively used by union members. The company and the union have been in wage negotiations. The device, which was connected to a computer in the next room and had a recording function, was found by union officials during a break between negotiation sessions. Some local media even reported that the device had recordings from years ago, raising speculation that the company had been spying on labor union members for years. Installing a listening device to spy on people is illegal and its use during negotiations is considered a violation of workers’ rights. Enraged union officials reportedly visited the company headquarters in Yeouido, western Seoul, the next day, demanding the management issue an official apology. The company explained that the employee at the center of the controversy installed the device alone as reference for his or her work. But some industry insiders saw it as an attempt by the company to gain an edge in the negotiation process. LG Chem and its labor union have been in talks since last month. While negotiations are an annual procedure, the company and the union have come to an agreement without dispute for the last 13 years. This year they are reportedly struggling to reach a consensus due to issues involving LG Life Sciences, which the chemical company acquired early this year.